• upload, post, e-mail or otherwise transmit any material that contains software viruses or any other computer code, files or programs designed to interrupt, destroy or limit the functionality of any computer software, network, hardware or telecommunications equipment. Accessing the materials on this Site from jurisdictions where contents are illegal is prohibited. Those users who choose to access this Site from other locations do so at their own risk and are responsible for compliance with local laws and regulations. By voluntarily submitting information, communications or content (including pictures and anecdotes) to the site, you agree that such submissions are non-confidential for all purposes. You further agree that such submissions become the property of Albaro's Mexican Food and that all title and interest therein, including all rights of copyright, shall rest with Albaro's Mexican Food at the time they are submitted and/or posted. Such submissions are subject to being used, reproduced, modified, published, edited, translated, distributed, performed and displayed in any media or medium, or any form, format or forum now known or hereafter developed, for any purpose, in perpetuity without further notice. The submission of such materials in no way creates any obligation or duty on the part of Albaro's Mexican Food to post or use such materials or, if we do so, to give you credit. YOU AGREE TO DEFEND, INDEMNIFY AND HOLD COMPLETELY HARMLESS ALBARO'S MEXICAN FOOD FROM AND AGAINST ANY AND ALL CLAIMS, DAMAGES, COSTS, AND EXPENSES, INCLUDING WITHOUT LIMITATION CLAIMS BASED UPON THE NEGLIGENCE OF ALBARO'S MEXICAN FOOD, ARISING FROM OR RELATED TO YOUR USE OF THE SITE, THE MATERIALS IT CONTAINS, AND ANY SITES LINKED TO THIS SITE. (a) YOUR USE OF THE SITE IS AT YOUR SOLE RISK. THE SITE IS PROVIDED ON AN "AS IS" AND "AS AVAILABLE" BASIS. ALBARO'S MEXICAN FOOD EXPRESSLY DISCLAIMS ALL WARRANTIES OF ANY KIND, WHETHER EXPRESS OR IMPLIED, INCLUDING, BUT NOT LIMITED TO THE IMPLIED WARRANTIES OF FITNESS FOR A PARTICULAR PURPOSE, MERCHANTABILITY, NON-INFRINGEMENT, QUALITY, PERFORMANCE, NON-INTERFERENCE WITH INFORMATION, AND ACCURACY OF INFORMATIONAL CONTENT. THERE IS NO WARRANTY THAT INFORMATION PROVIDED HEREUNDER, OUR EFFORTS, OR THE SITE WILL FULFILL ANY OF YOUR PARTICULAR PURPOSES OR NEEDS. • THE QUALITY OF ANY PRODUCTS, SERVICES, INFORMATION, OR OTHER MATERIAL PURCHASED OR OBTAINED BY YOU THROUGH THE SITE WILL MEET YOUR EXPECTATIONS. (d) NO INFORMATION, WHETHER ORAL OR WRITTEN, OBTAINED BY YOU FROM ALBARO'S MEXICAN FOOD OR THROUGH THIS SITE SHALL CREATE ANY WARRANTY NOT EXPRESSLY STATED IN THIS AGREEMENT. • ANY OTHER MATTER RELATING TO THE SITE. IF YOU ARE DISSATISFIED WITH THE SITE, OR ANY OF THE INFORMATION CONTAINED THEREON, OR REFUSE TO ABIDE BY THIS AGREEMENT, YOUR SOLE AND EXCLUSIVE REMEDY IS TO DISCONTINUE YOUR USE. NOTWITHSTANDING THE FOREGOING, ALBARO'S MEXICAN FOOD'S LIABILITY TO YOU SHALL BE LIMITED IN ALL INSTANCES TO THE SUM OF PAYMENTS MADE FOR MERCHANDISE PURCHASED THROUGH THIS SITE, BUT IN NO CASE SHALL SUCH AMOUNT EXCEED $1,000. YOU FURTHER AGREE NOT TO JOIN IN ANY LAWSUIT WITH ANOTHER PERSON OR SERVE AS A CLASS REPRESENTATIVE OF ANY CLASS ACTION LAWSUIT AGAINST ALBARO'S MEXICAN FOOD ARISING OUT OF THE USE OF THE SITE. ALBARO'S MEXICAN FOOD SHALL NOT BE HELD LIABLE FOR ANY REPRESENTATIONS ON THIRD PARTY SITES IN RELATION TO THE INFORMATION PROVIDED IN THIS SITE. (a) Albaro's Mexican Food grants you a personal, revocable, non-transferable, and non-exclusive right and license to use the object code of the Site on a single computer; provided that you do not (and do not allow any third party to) copy, modify, create a derivative work from, reverse engineer, reverse assemble or otherwise attempt to discover any source code, sell, assign, sublicense, grant a security interest in or otherwise transfer any right in the software for the Site except and only to the extent that such activity is permitted by applicable law notwithstanding this limitation. (b) The Albaro's Mexican Food mark, Albaro's Mexican Food and Design logo, and other trademarks, service marks, labels, product names and service names (collectively, the "Marks") are owned or licensed by Albaro's Mexican Food. You agree not to copy, display or otherwise use any of the Marks without the prior written permission of Albaro's Mexican Food. Notwithstanding the foregoing, the Marks may not be used in any manner likely to cause confusion, disparage or dilute these marks and/or in connection with any product or service that is not authorized, sponsored, endorsed by, or affiliated with Albaro's Mexican Food. (c) The entire Site, and all object code and source code, text, graphics, multimedia content, including but not limited to images, illustrations, audio and video clips, html and other mark up languages, and all scripts within the site associated therewith, are Copyright © 2007 - 2009, ALBARO'S MEXICAN FOOD.. All rights reserved. The copyrighted and proprietary property of ALBARO'S MEXICAN FOOD may not be duplicated or used without ALBARO'S MEXICAN FOOD prior written consent. Albaro's Mexican Food may update, revise, supplement, modify or amend this Agreement at any time. Any updates, revisions, supplements, modifications or amendments shall be effective immediately upon its posting on the Site. You agree that you will be bound by this Agreement, however and whenever it is updated, revised, supplemented, modified, or amended, whether you have actual or constructive notice of, and whether you have used or continue to use the Site after, the updates, revisions, supplements, modifications or amendments. This Agreement constitutes the entire agreement between you and Albaro's Mexican Food with respect to your use of the Site. There are no other representations, warranties, terms, agreements or conditions, either written or oral, with respect to your use of the Site except as set forth in this Agreement. 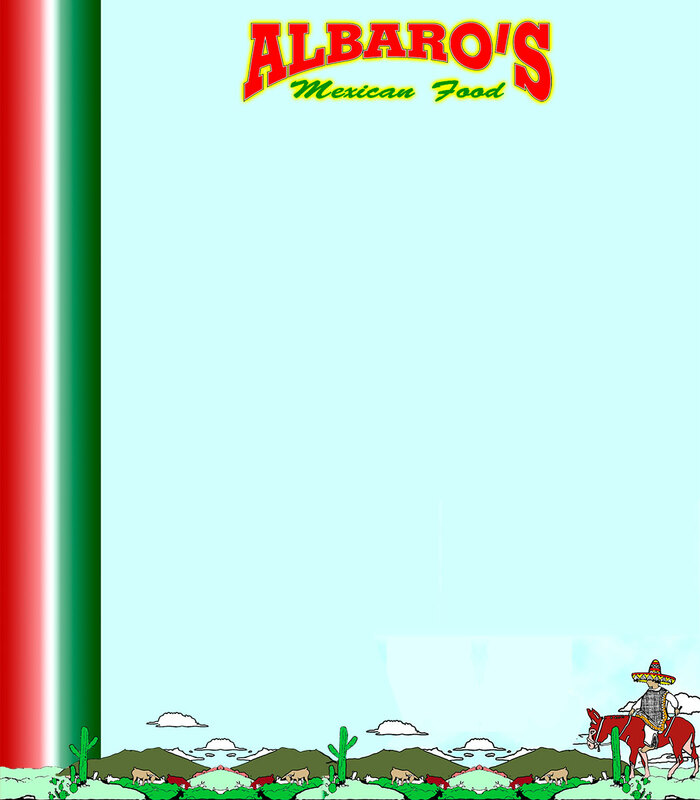 This Web site (excluding linked sites) is controlled by Albaro's Mexican Food from its offices within the State of California, United States of America. The Site can be accessed from all 50 states, as well as from other countries around the world. As each of these jurisdictions has laws and regulations that may differ from those of California, by accessing this Web site both you and Albaro's Mexican Food agree that the statutes and laws of the State of California, without regard to conflicts of laws principles thereof, will apply to all matters relating to use of this Site (whether grounded in tort, contract, law or equity). This contract is fully performable in San Bernardino County, California. Any litigation arising between the parties hereto shall be brought only in the state or federal courts having subject matter jurisdiction in San Bernardino County, California. You hereby irrevocably and unconditionally consent to the jurisdiction of any such court and hereby irrevocably and unconditionally waive any defense of an inconvenient forum to the maintenance of any action or proceeding in any such court, any objection to venue with respect to any such action or proceeding, and any right of jurisdiction on account of the place of residence or domicile of any party thereto. Albaro's Mexican Food may terminate your right to use this Site, with or without cause at any time in its sole discretion, including, without limitation, your violation of this Agreement, failure to provide accurate registration data, and lack of use. In the event of termination, all representations, warranties, indemnifications, and promises made by you shall survive. This Site is not directed at children under the age of 13 and does not knowingly collect personal information from children under the age of 13. If Albaro's Mexican Food obtains actual knowledge that it has obtained personal information about a child under the age of 13, that information is immediately and permanently deleted from our records. © 2009 Albaro's Mexican Food. Website Developed by Mex Printers, Inc.